The Janus stone is Elly Griffiths's second mystery novel featuring Ruth Galloway, forensic archaeologist. This series is a lovely mix of history, archaeology & detection. The detective is DCI Harry Nelson. Harry & Ruth had a one night stand in the first book, Crossing Places, & now she's pregnant, but hasn’t yet told Harry about the baby. I love their relationship. Ruth is spiky & independent (she lives on an isolated marshland in Norfolk, perfect for potential assassins to sneak up on her in the night). Harry is married & unsure what to do about his relationships with his wife & Ruth. They're not in love but definitely attracted. A child's headless body is found during a dig on the site of a new apartment complex. The head of the child is found in a well. The site was once a children's home but until the age of the remains is determined, they could be Roman or even older. There was a Roman tradition of burying human bodies under the doorways of houses as an offering to the gods of arrivals & departures, Janus & Terminus. Head cults were also known among the Celts, so was this an offering to the gods? Once the remains are confirmed as more recent, mid 20th century, attention turns to the children’s home run by Father Hennessey & a group of nuns & to the Spens family, who lived there before the home was established & who still own the site. Edward Spens is a wealthy man who doesn’t want his development delayed by archaeologists finding bodies in the foundations. The Janus stone is a fast-moving, absorbing story. It’s unusual to find characters so well-defined & so interesting after only two books of a series. Harry’s police team are enthusiastic & ambitious & Harry may be technologically incompetent but he’s not too proud to ask for help. Ruth is a likeable character. For once the protagonist isn’t a stick thin, conventionally beautiful woman with her life all worked out. 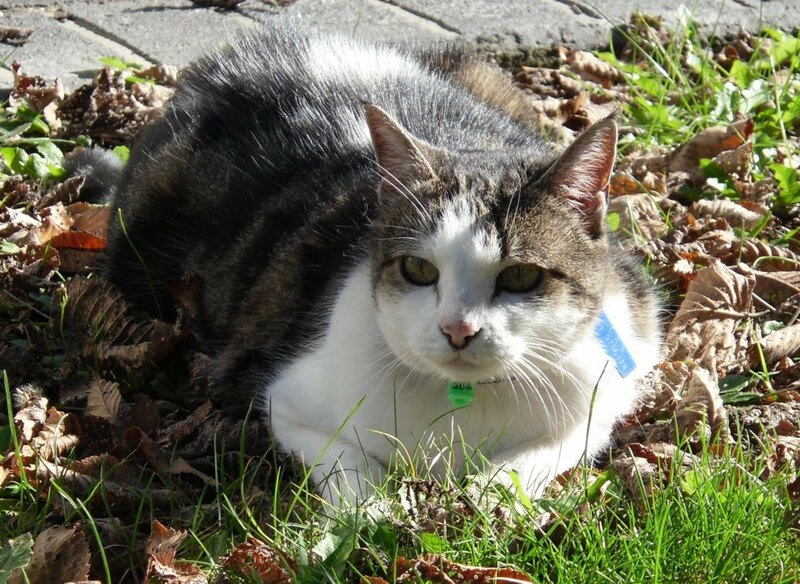 Ruth is overweight, unfashionable, a loner who prefers the company of her cat to living with other people. Her pregnancy is an unexpected joy to her but also a dilemma. How involved does she want Harry to be? At least it looks as though her strained relationship with her born-again Christian parents may improve after their initial shock & disapproval wears off. If you enjoy Kate Ellis’s Wesley Peterson series, I think you’ll enjoy Elly Griffiths. I’m looking forward to the next book in the series. 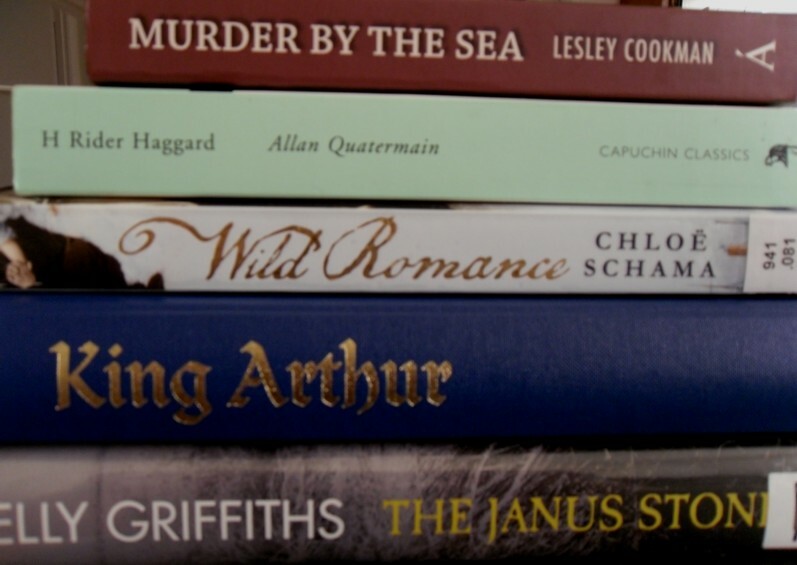 Catherine Oliphant writes romantic stories for magazines. At the beginning of Less than Angels, she’s sitting in a cafe speculating about the people sitting near her, wondering what their real stories are. Catherine lives with Tom Mallow, a young anthropologist just back from the field in Africa. Deidre Swan is a student at the anthropological institute & she’s dazzled by Tom’s looks & his aura of achievement. What man could resist such hero worship? Before long, Tom & Deirdre are holding hands in the little local restaurant where Tom & Catherine used to go & Catherine realises that she’s about to be superseded. Deirdre’s hand still lay on Tom’s; their moussaka would be getting cold, Catherine thought, & then pulled herself up, horrified at the sardonic detachment with which she had been watching them... I’m not one of those excellent women, who can just go home & eat a boiled egg & make a cup of tea & be very splendid, she thought, but how useful it would be if I were! Deidre lives at home in dull suburbia with her mother & aunt, next door to Alaric Lydgate, an eccentric anthropologist who is sometimes seen wearing African masks in his backyard. Less than Angels is full of recognizably Pymian characters. I loved Catherine, one of my favourite Pym heroines. I always think she may have more than a little of Barbara Pym herself in her. A writer, who enjoys speculating on the lives & loves of others, quotes bits of poetry & makes odd jokes at the wrong moments. Tom is a very ordinary, insipid young man, much more suited to conventional Deirdre than the more unusual Catherine. Catherine realises that she’s managed without him very well for the two years he’s been away &, although there are some tears, I don’t think she is very distressed when he leaves her for Deirdre. Barbara Pym worked for an anthropological journal & she uses the experience here with her portraits of impecunious young students vying for study grants & the sometimes less than ethical way that handsome men inveigle money for their projects from susceptible widows. I enjoyed Less than Angels very much although it will never be in my top rank of Pym. Excellent Women, A Glass of Blessings & Some Tame Gazelle are among my favourite comfort reads. I’m so glad Virago is bringing Barbara Pym back into print. 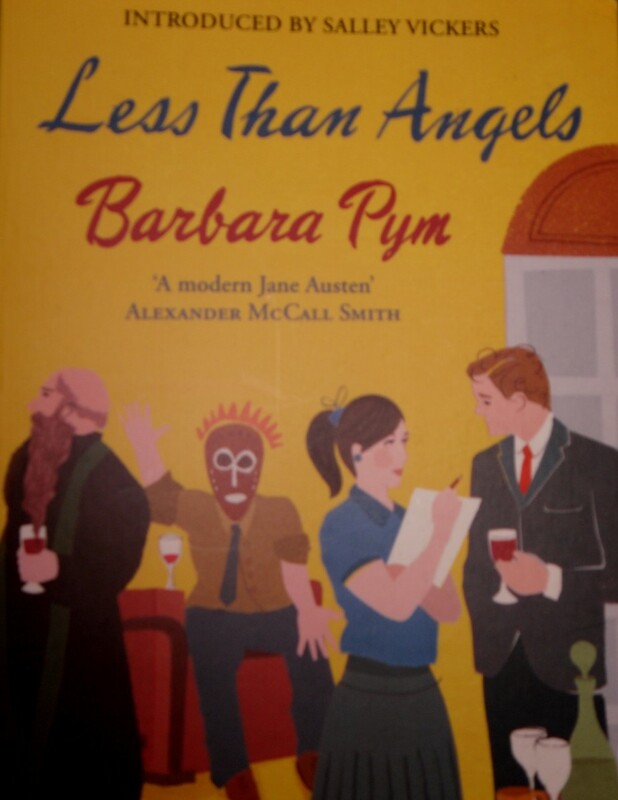 There's a copy of Less than Angels, and many other books by Barbara Pym, available at Anglophile Books. I won’t have much time to post this week. I’ve just finished reading Barbara Pym’s Less than Angels which I loved. I read it years ago but I treated myself to the new Virago edition & I enjoyed meeting Catherine again – one of my favourite Pym heroines. I’ll review it properly at the weekend but here’s Desperate Reader’s enthusiastic review to whet your appetite. Tomorrow night I’m helping out at an annual Library Week event we hold in partnership with our local Borders store. It’s called Bag A Book. 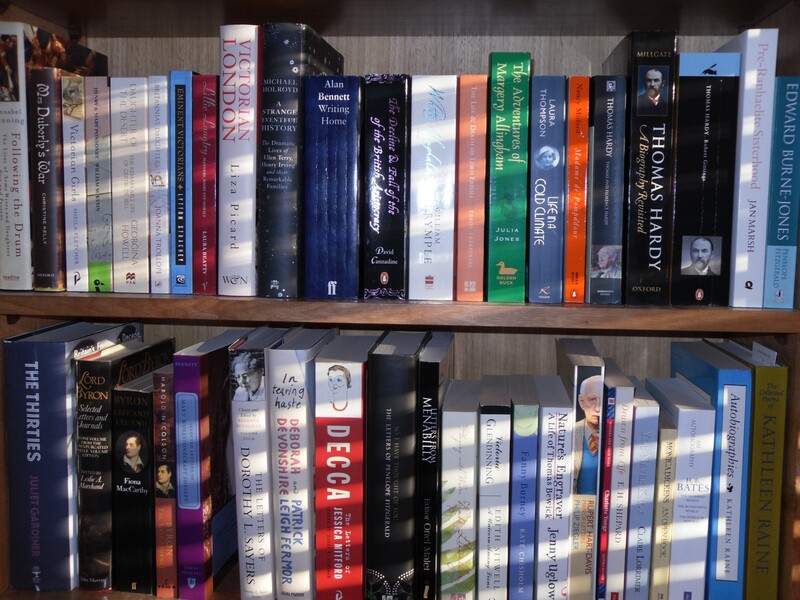 Our patrons come along to Borders & choose 2 books for their local library’s collection. It’s a very successful event. This year we’ve had to cap the numbers at 225. People love choosing books with someone else’s money (I know, I do it for a living) & they take it very seriously. I find it amazing that there are rarely any duplicates – apart from the year we ended up with 5 copies of Gordon Ramsay’s latest cookbook - & everyone takes a lot of care in their choice. We offer to put a bookplate in the books so they can go along to the library & visit “their” book. Then, on Wednesday I’m going to Sydney for the day to visit a new supplier. That will be a long day. I’ll have to leave home at about 6.30 & won’t be home until after 8. At least I can read on the plane. I’m not sure what to take. A favourite comfort read like Josephine Tey’s Daughter of Time? 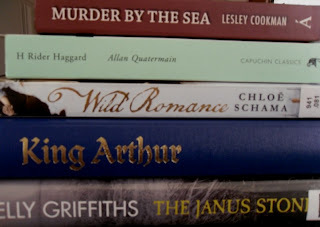 Or something new from my tbr table like Allan Quatermain? But what if big game hunting in Africa doesn’t grab my attention? Maybe I’ll take both, the Tey is very slim, I should be able to fit both in my bag. 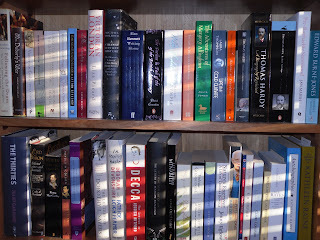 I’ll leave you with a couple of photos of my tbr shelves in the late afternoon light. 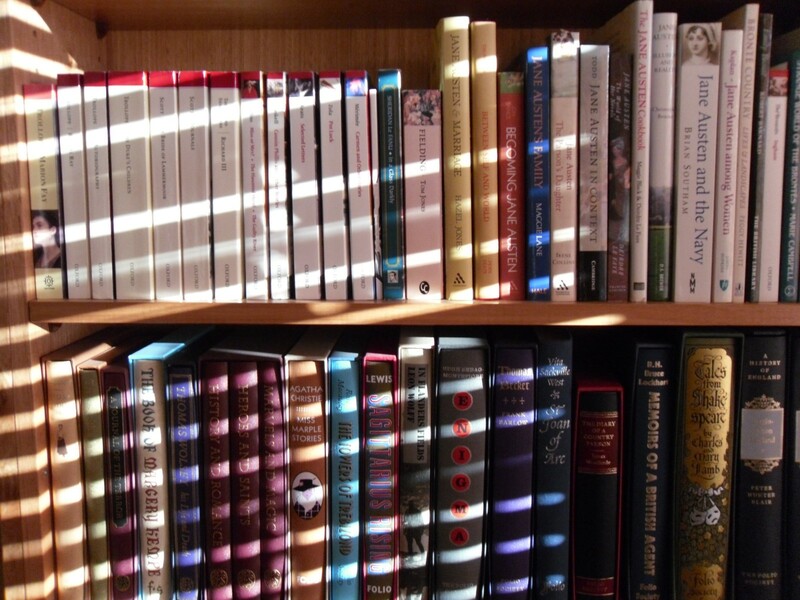 You can see my Folio Society books, OUP classics, books about Jane Austen, some history & literary biographies. There’s also a photo of the tbr table. Enjoy your week, whatever you’re doing. I’ve never seen any of the many versions of the story of Sweeney Todd. So, I was intrigued to read the original novel when it was chosen by my 19th century bookgroup. 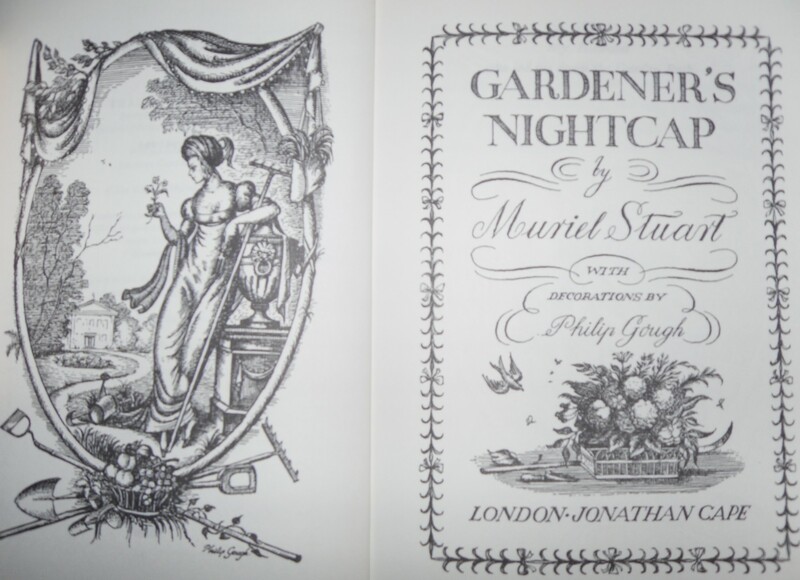 We’re currently reading 19th century books & plays that inspired musical versions. We’ve recently read La Dame aux Camellias & now Sweeney Todd. The novel is actually called The String of Pearls & I’ve discovered through the posts of the very knowledgeable members of the group, that there have been many changes to the story in the subsequent musical versions. My copy of the book actually has Johnny Depp in the latest movie version of the Stephen Sondheim musical on the cover, but I couldn’t take a non-flaring photo of it so I used this one instead. All I knew about Sweeney Todd was that he murdered his victims by means of an ingenious swivelling barber’s chair which dumped them in the cellar where he cut their throats & that they were made into meat pies by Mrs Lovett. What I didn’t expect was that the book would be such a great read. The author is supposed to be Thomas Preskett Prest but even this isn’t certain. The story first appeared in Edward Lloyd’s People’s Periodical. Lloyd was renowned for ripping off famous authors of the day. Some of his other serials were Oliver Twiss & Nikelas Nickelberry. I’m sure I don’t have to tell you whose books were being plundered there! Copyright laws were practically non-existent in the early 19th century & unauthorized print & stage versions of any successful novel were commonplace. The String of Pearls is set in the 1780s in London. Sweeney Todd has set up his barber’s shop & is murdering wealthy men with alacrity. He has cupboards & chests filled with the money, gold, jewels & walking canes of these unfortunate gentlemen & their remains are conveyed by an underground tunnel to Mrs Lovett’s pie shop where they’re made into pies by a succession of unfortunate cooks. As soon as the cooks work out where the meat is coming from, they’re made into pies as well & a new employee is sought. This is a rip roaring story with grotesque characters & not a lot of character development. We never discover how Todd & Mrs Lovett met or why they began their evil trade. Todd has a resourceful assistant, Tobias Ragg, who is shocked when he disobeys orders & searches Todd’s rooms when he’s out. He soon realises what’s going on &, after trying to escape, ends up imprisoned in an asylum. The pearls of the title are the property of a young seaman who is presumed lost at sea. Mark Ingestrie went to sea after his love affair with the beautiful Johanna Oakley is forbidden by her parents. He is on his way home to her with the pearls when his ship is lost. The only survivor is Captain Thornhill, Mark’s friend. He has the pearls & is on his way to tell Johanna of Mark’s death when he stops for a shave at Sweeney Todd’s barber shop. That’s the last we see of Thornhill, although his faithful dog, Hector, stands guard outside the door of the shop, arousing the suspicions of his friend, Colonel Jeffrey, who is determined to find out what has happened. One of many loose ends in the story is what happens to Hector. We can only presume he ended up in a pie but his fate is uncertain. Johanna is heartbroken when she hears Jeffrey’s story & decides to get a job as barber’s assistant, dressed as a boy. A local magistrate with his own suspicions of Sweeney Todd becomes involved & the scene is set for the exciting ending. The enjoyment of the young clerks & lawyers who frequent the shop is emphasized & lingered over in the most stomach-churning way as the reader knows what the eaters do not. As usual in this type of melodrama, the villains are much more interesting than the hero & heroine. This is definitely a page turner. It’s a story that could have been forgotten if its vitality & ingenuity hadn’t ensured its popularity at the time & made it the basis for the many versions of the story that have followed. Gorgeous crisp autumn weather here this week. The last few mornings have been very cold until the sun breaks through & then it's so warm in the sun. This is the kind of warmth I like, not the burning heat of summer. We've had no rain for over a week now though, so hopefully the forecast for rain early next week is right. 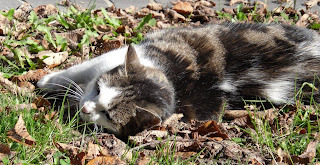 I was out this morning sweeping the leaves from the driveway onto the garden. They make the drive very slippery when they get wet so I try to sweep if rain is predicted. 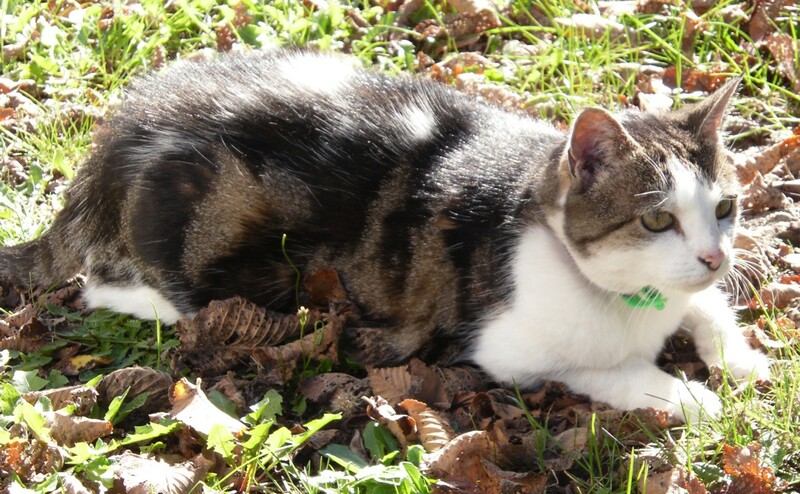 Abby has been enjoying the autumn warmth as well. She sits as close as possible to the heater when I get up in the morning & moves outside to a favourite sunny spot when the time is right. I took these photos yesterday morning. 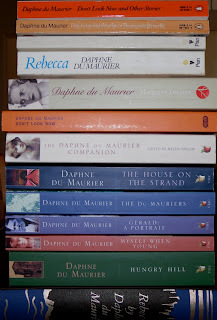 I read most of Daphne Du Maurier’s novels as a teenager in the 70s. Rebecca was my favourite, of course. I loved Laurence Olivier in the Hitchcock movie (even though they had to change a few plot points to make Max less culpable) & I read the book over & over again. 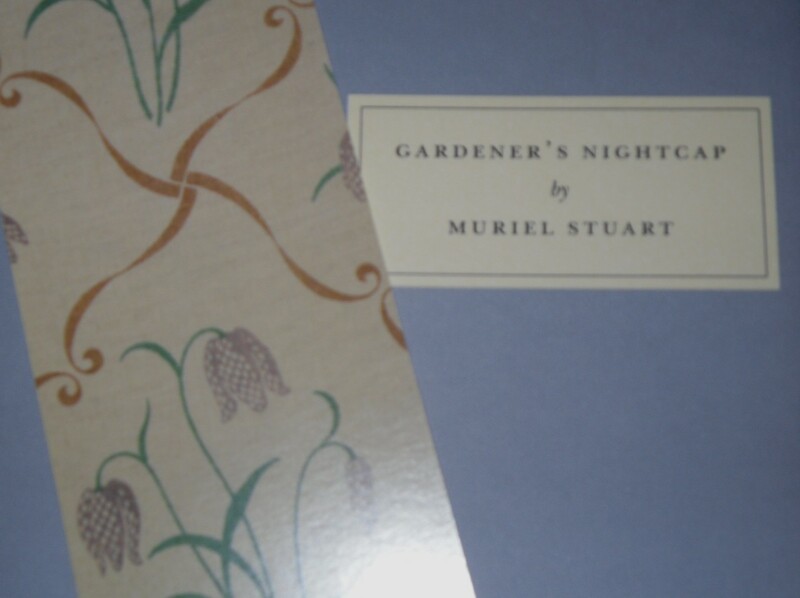 I still have a few of the novels to go & I’ve only read one of her volumes of short stories. I borrowed most of her books from my local library in the old yellow Gollancz hardbacks. 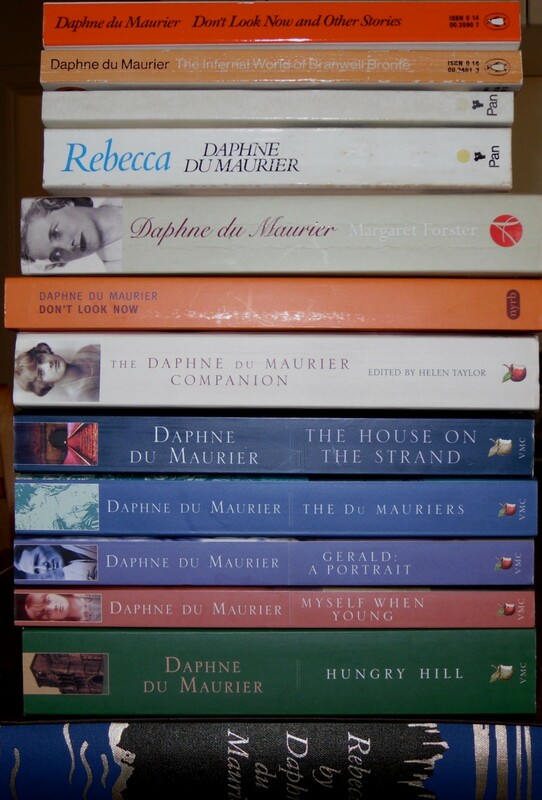 I was very pleased when Virago started reprinting Du Maurier so I could catch up on a few titles I’d never read, including some of the non-fiction books she wrote about her family. I’d also like to find time to reread Margaret Forster’s biography of Daphne. If you click on the photo, I hope you can see the titles of my Du Mauriers more clearly. The 3rd book down with the very faded spine is The Rebecca Notebook & other memories. After I took the photo I remembered my copy of Vanishing Cornwall which is on another tbr shelf. 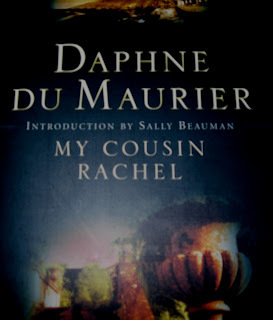 My Cousin Rachel was another of the books I read back then. When Cornflower announced it as her next Book Club choice, I was inspired to take my copy down from the shelf for a reread. There are some women, Philip, good women very possibly, who through no fault of their own, impel disaster. Whatever they touch somehow turns to tragedy. I don’t know why I say this to you, but I feel I must. The story is one of jealousy & love. Philip Ashley has been brought up by his cousin, Ambrose, a middle-aged bachelor, at their family home in Cornwall. Ambrose travels to Italy for his health, &, while he’s there, he meets a distant relation, the beautiful Rachel, Countess Sangaletti. Philip is amazed to hear that Ambrose & Rachel have married & they are living in her villa in Naples. Philip is jealous but soon his jealousy turns to concern as Ambrose’s letters become mysterious. There are hints of poison & madness. Ambrose’s final letter, delivered as Philip is already on his way to Naples to find out what is going on, is just a few scribbled lines. For God’s sake, come to me quickly. She has done for me at last, Rachel, my torment. If you delay, it may be too late. Philip arrives in Naples to the news that Ambrose is dead & Rachel has already left Naples, no one knows her destination. The scenes in Italy are beautifully done. Philip, young, stiff, very English, has travelled from cold, windswept, provincial Cornwall to warm, sensual, cosmopolitan Naples. He’s out of his depth. Shocked by the news of Ambrose’s death, suspicious of the servants at the villa & hostile to Signor Rainaldi, Rachel’s friend & lawyer, he is determined to find out the truth. Heartbroken, he returns to England to hear from his godfather, Nick Kendall, that Rachel has arrived in England & wants to visit. Ambrose hadn’t changed his will on his marriage so Philip has inherited everything. Rachel has nothing. Philip is immediately suspicious of her motives. Once she arrives, however, he is beguiled by Rachel. She captivates everyone she meets – apart from Philip’s childhood friend, Louise Kendall, who is jealous in her turn. Philip becomes increasingly infatuated with Rachel, culminating with his desire to give her the property outright when he becomes his own master on his 25th birthday. But there are still questions & doubts. Ambrose’s family has a history of brain fevers, maybe madness. His illness in Italy was similar to a brain fever & his paranoid letters could have been a result of this. Rachel is an enthusiastic & knowledgeable gardener & brews herbal tisanas & remedies. Did she poison Ambrose? If she knew he hadn’t changed his will, there would be no point. But, did she know? She presents herself as a heartbroken widow, she plays the part well, but is she just trying to influence Philip to give her an allowance? Then, stories begin to circulate of the life she led with her first husband, a dissolute gambler who was killed in a duel. By now, Philip is in thrall to Rachel & desperate to marry her. The scene is set for the final tragedy. I shall become a Justice of the Peace, as Ambrose was, & also be returned, one day, to Parliament. I shall continue to be honoured & respected, like all my family before me. Farm the land well, look after the people. No one will ever guess the burden of blame I carry on my shoulders; nor will they know that every day, haunted still by doubt, I ask myself a question which I cannot answer. Was Rachel innocent or guilty? Maybe I shall learn that too, in Purgatory. This is a fantastic read, full of suspense. The romance of Cornwall, an unreliable, impulsive narrator, an enigmatic heroine & those unanswered questions. 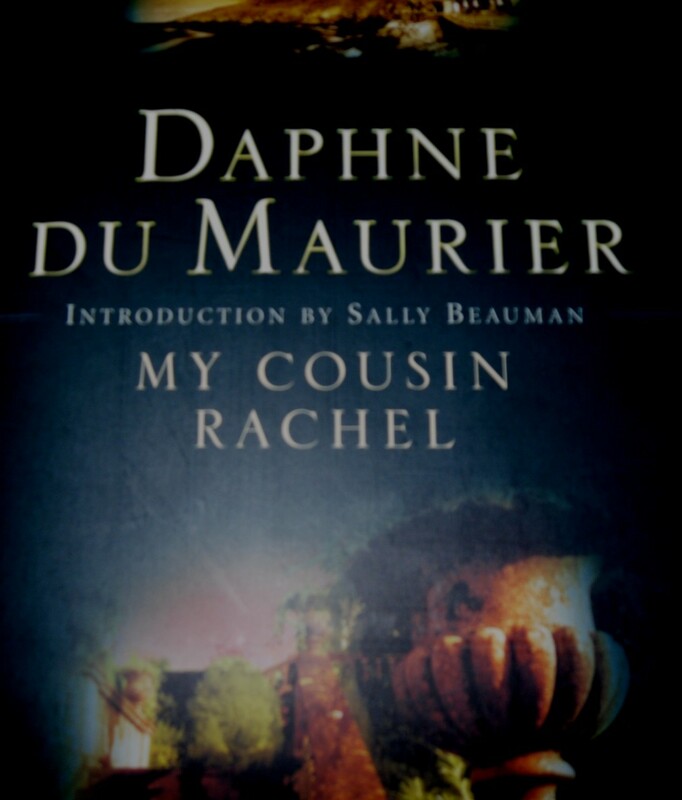 Du Maurier was a superb storyteller & this is one of her most successful novels. If you haven’t already read it, you’re in for a treat. Cut the marrows when they are six inches long, & you have a delicate dish. Of course if you grow your marrows as large as Zeppelins there is no help for you. They must cumber the ground as usual. 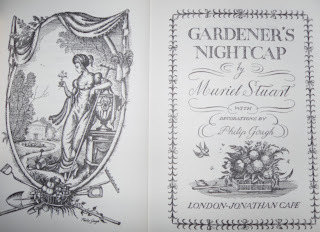 Yet the first duty of a garden is quietude – a place where peace may be fostered, where the eye, wounded by the glare of modern roads & modern houses, may rest upon grey shadow & green shade. But from the noisy street one is so often led into the noisy garden. The Colt’s Foot is enchantingly named Son-before-Father, because its flowers always appear before the leaves. Its name Colt’s Foot refers to the large hoof-shaped leaves, the resemblance being probably strengthened by the shaggy flower stems. I felt I was being led through a gorgeous garden by a very knowledgeable host, full of her own opinions but willing to give good advice to the novice gardener. I’m spending the day in town tomorrow. I’m off to see the Rupert Bunny exhibition at the National Gallery of Victoria. Then, a bowl of noodles at the Chocolate Buddha & a concert by the Melbourne Chamber Orchestra at the new Recital Centre. I’ve booked tickets for four of the MCO’s Sunday afternoon series this year. They’re playing some of my favourite pieces including the Beethoven & Mendelssohn violin concertos. Tomorrow it’s one of the Bach violin concertos & Tchaikovsky’s Serenade for strings among other works. I’m looking forward to seeing the Recital Centre too as it will be my first visit. I’ve been fascinated by bog bodies for as long as I can remember. I love history & archaeology (reading about it that is, I’m much too lazy to wield a trowel); I’m a big fan of Time Team & I loved Julian Richards’ TV series of some years ago called Meet The Ancestors. The investigations often ended with a facial reconstruction of the person who was the subject of the excavation. Looking into the face of someone who lived & died thousands of years ago can be a moving experience. The classic book about bog bodies is The Bog People by P V Glob, written in the 60s by a Danish archaeologist who wanted to explain the phenomenon for the layperson. He succeeded brilliantly. His book is still in print (my edition is by the wonderful New York Review Books) & Glob brings the Iron Age alive with his descriptions of the bodies & what can be learned from them of the lives of people in Europe thousands of years ago. Bog bodies are the preserved corpses of people who have been deposited in peat bogs. The conditions of the peat bog act to preserve the body. The preservation is so great that when the bodies are unearthed, the finders often call the police, thinking they’ve found a recent murder victim. Often the hair and fingernails are intact. The photo of the hands & feet of Graubelle Man on the cover of Sanders' book is so beautiful. The lines of his skin are visible, his hands are folded as if holding something. The bog may crush the body or the peat cutters may chop off a limb as they uncover it, but the bodies are often astonishingly complete & look as though they’re asleep. Most of the bog bodies have been found in England, Ireland & Scandinavia as this is where peat bogs are formed. There are so many questions about these people & just as many theories about them. They’re usually named after the places where they’re found – Tollund Man, Graubelle Man, Lindow Man – or they’re given fanciful names such as Pete Moss. The bodies are often naked, sometimes there’s a noose around the neck or the hands are tied behind the back. This has led to theories that these are criminals, executed for some particularly horrible or transgressive crime as they’re denied a decent burial & just thrown into the bog like rubbish. There’s also a theory that these are sacrificial victims, maybe of high status, ritually killed to appease the gods. There has been much analysis of the last meal eaten by these people & whether they may have suffered a ritual triple death by poison, strangulation & stabbing. We know so little about the beliefs & lives of Iron Age people that these bog bodies offer a unique opportunity to find out more. 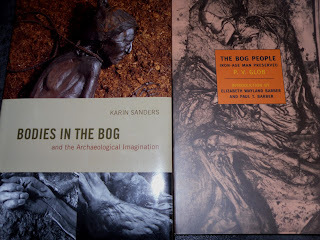 Karin Sanders’s new book, Bodies in the Bog, takes a slightly different look at bog bodies. She looks at the way they have influenced art & literature & also examines the contentious issue of the display of bog bodies in museums. The display of human remains is a difficult issue. Many indigenous people from around the world have been successful in having the remains of their ancestors repatriated from museums so they can be given a dignified burial. What is to be done about the bog people? They have no immediate descendants or tribal people to champion them but many people feel uncomfortable about looking at Egyptian mummies in their sarcophagi let alone bog bodies that still look like a sleeping human being. The alternative theory is that the bodies are an artefact to be learned from. Some museums display a replica of the body while others try to reproduce the bog with the body in situ. Sanders has taken examples from the poetry of Seamus Heaney, the stories of Margaret Atwood & Anne Michaels & the art of Trudi van der Elsen to examine the ways that bog bodies have captured the imagination of creative artists. She also looks at the way the bodies were portrayed & written about in the past & looks at the different methods of facial reconstruction where the remains have been crushed or distorted by the pressure of the bog over the centuries. I enjoyed the book very much although some of it was very academic. I have to admit feeling out of my depth among some of her theoretical arguments. But, the book has many beautiful illustrations of the bog bodies & the artwork inspired by them. Sanders has taken a very thoughtful look at the phenomenon of the bog bodies. I think Sanders & Glob should be read together to get a truly rounded view of the historical context as well as the artistic & moral issues that arise from our quest to know these people of the past. It's a beautiful autumn day here, started out cloudy but the sun has burst through & now it's warm & sunny. The garden is looking very pink at the moment. 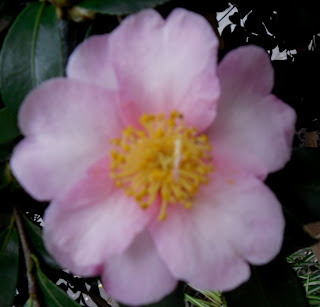 The camellia & cyclamen are blooming. 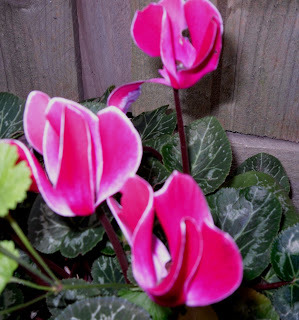 You can just see the leaves of the coconut geranium in the cyclamen photo. I planted this in a pot which sits in the herb garden & it has the most gorgeous scent whenever I brush past it. I was picking parsley for dinner the other night & trying to find it by scent & feel as it was almost dark. 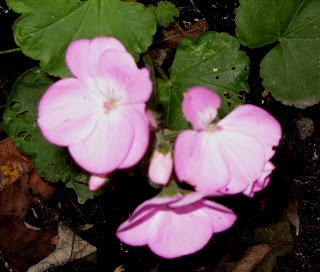 The coconut geranium was quite a distraction as it's grown quickly & wound itself among all the other plants. 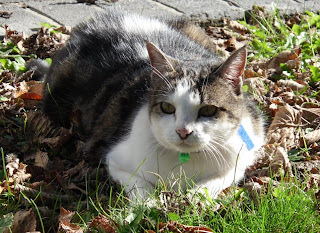 Abby is sunning herself on the back porch at the moment but earlier this morning we were in the front garden investigating the autumn leaves. I hope everyone has a lovely Sunday wherever you are. I hope I’ve just scraped under the wire for Persephone Reading Week with this review. After thinking I wouldn’t finish a new Persephone in time, I have done just that. Daddy’s gone a-hunting is the story of Ruth Whiting’s life of suburban frustration & misery in the late 1950s. Ruth is married to Rex, a dentist who lives in London during the week & only comes home for the weekend. She has two younger boys at school & an 18 year old daughter, Angela. Ruth is at home, alone, surrounded by other wives in the same situation. They’re all bored, spending their time in gossip & shopping. Rex is unfaithful. He thinks Ruth doesn’t know but she is well aware of his mistresses. He’s an unsympathetic character, impatient & rude to his wife & daughter although he loves his sons & enjoys spending time with them. Rex’s relationship with his latest mistress, Maxine, is incredibly pathetic. He’s middle-aged, fat & unattractive yet he pleads for compliments & favours from this silly girl. Ruth & Rex had to get married when she became pregnant & Rex resents Angela because of this. His whole attitude is that Ruth virtually trapped him into marriage & I think he justifies his affairs as his “revenge” for the way his life was hijacked. It’s ironic that he tells Ruth that if Angela ever became pregnant out of wedlock he’d throw her out. Angela does become pregnant to her truly awful boyfriend, Tony. The letter Tony writes Ruth worming his way out of paying for the abortion is horrible, self-serving & selfish. This dilemma, in the days when abortion was illegal, brings Ruth & Angela gradually closer together. Angela is a sulky, awkward girl who has always felt superior to her ineffectual mother. She’s ungracious in her fear although desperate for her mother’s help. It’s only at the end that they seem to reach an understanding. The machinations Ruth has to go through to help Angela (without Rex finding out) are frightening. It’s hard to believe this was just over 50 years ago. I was born in the 60s & the state of women’s lives depicted here hardly seems to have moved on from the 19th century novels I love so much. Thank goodness for feminism is all I can say! It was impossible to open the garage doors silently; but by now, even if she was heard, it would be too late. She put on her shoes, pushed the doors back & got into the car. The engine coughed, stuttered & died...She imagined Miss de Beer storming into the garage in her candlewick, her hair in armour, wrenching her out of the car, telephoning Rex...Reversing into the drive she saw the lit square of Miss de Beer’s window & an agitated figure wrestling to open it. She put her hand out of the car & waved cheerfully, keeping her hand fluttering as she swerved away down the drive. The women ran around in a fluster, like nuns forced on a secular outing. Between their husbands & their children they didn’t know where they were. The quantities of food made them, used to cream cheese & water biscuits, ill. They were agitated at the prospect of having to explain themselves, of having to live in public for so long. As the time of arrival came nearer they telephoned each other, breathlessly, as though for the last time. I usually don’t read the Introductions of novels until after I’ve read the book as I don’t like to know too much of the plot. This time though I did read Valerie Grove’s introduction first. 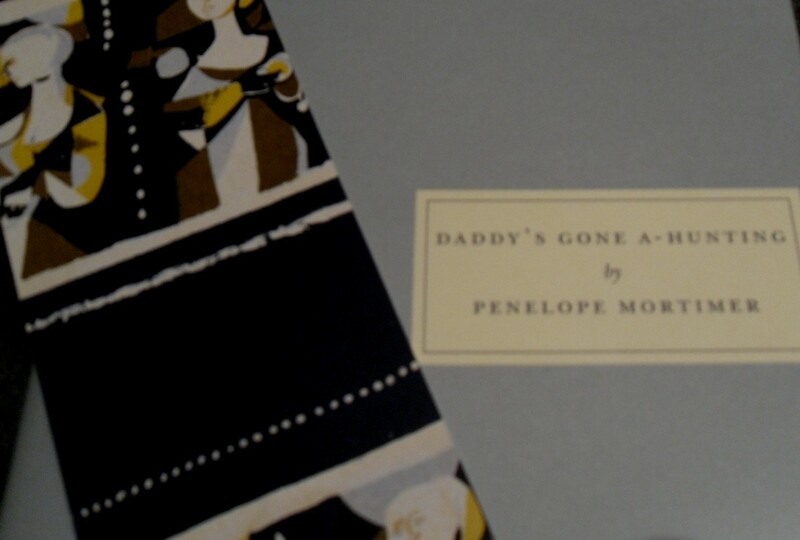 It really set the book in the context of Penelope Mortimer’s life. She was married to John Mortimer, barrister & famous author of the Rumpole books. Penelope Mortimer’s novels were created out of her own life to a great extent & this book describes a period in Mortimer’s life when similar things were happening to her. She had periods of mental breakdown, her marriage was blighted by her husband’s unfaithfulness & she lived a similar life to Ruth’s. Mortimer always worked though, at her novels & journalism, so her life had more purpose than poor Ruth’s seems to. Daddy’s gone a-hunting is a terrifically readable book. The characters & situations are full of a kind of black humour as well as despair at Ruth’s thwarted life. It’s not typically Persephone in period but the themes of domesticity & relationships are very much in the tradition of other Persephone books such as Joanna Cannan’s Princes in the Land & Richmal Crompton’s Family Roundabout. I had planned to review one of my favourite Persephones as part of Persephone Reading Week as well as read a new one. Well, I’m going to have to cheat a bit as I’ve started Penelope Mortimer’s Daddy’s gone a-hunting but I just don’t think I’m going to finish it before the week is up. I’ve had a really busy week & I’ve been falling asleep over my book with Abby on my lap early every night this week. So, I’m just reviewing my favourite Persephone. Little Boy Lost is one of my top 5 Persephones. Don’t ask me what the others are because they change! At this moment, the list would be Little Boy Lost, Few Eggs & No Oranges, Fidelity, They Were Sisters & A House in the Country. Ask me in a month’s time & they would be different but Little Boy Lost & one of the Dorothy Whipples would always be there. I’ve read all of these more than once & they really sum up for me what Persephone is about & why I love their books. Compulsively readable, with characters the reader cares about, full of domestic details about houses, clothes, relationships, the way they lived then. Little Boy Lost is the story of a man's search for his son, lost in France during WWII. On a deeper level, it is the story of a man's search for himself, rediscovering his capacity for love after the experiences of war. Hilary Wainwright saw his son John just once, the day after he was born in Paris. Hilary's wife Lisa was working for the Resistance and was captured and killed by the Gestapo when John was a baby, and the child disappeared. After the war, Hilary is contacted by Pierre, a friend of Lisa's, with news of a child who may be John. Hilary sets out to find this child. His search takes him through the devastated French countryside to the small town where the child lives in an orphanage. Hilary's growing relationship with little Jean (the name given to the child) is very moving. Hilary's resistance to love, to being hurt again is vividly portrayed. Jean is a delightful child, a representative of the many thousands of children left orphaned and lost by war. The reader longs for these two lost souls to fall into each other's arms. By the end of the novel, I didn't care whether Jean was Hilary's son or not. The unsentimental yet deeply moving style of the novel is totally engrossing, once started, I could hardly bear to put it down. I love the fact that Persephone’s books about WWII were written at the time or shortly after. This gives them such immediacy, especially in the books written in the middle of the war. The outcome was unknown & the experience of living in Britain with all the uncertainty that comes from war makes these books compelling. Little Boy Lost takes the reader to a France devastated by years of occupation. The countryside is blighted. People are trying to rebuild their lives. So many families have been shattered. This is a book about hope, the hope that maybe one family can be put back together again & move forward into a better future. 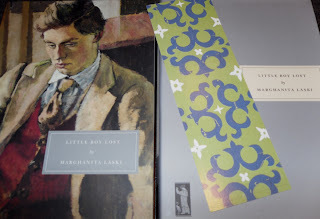 Little Boy Lost should be read once very quickly to find out what happens to Hilary & Jean & then, read it again slowly & admire the way Laski has written this lovely novel. The Flesh Tailor is the latest in Kate Ellis’s terrific series of police procedurals. I’ve been reading this series since the first book, The Merchant’s House, was published in 1998. I love the mix of history, archaeology & mystery that is such a feature of the books. The books are set in Tradmouth, a coastal town in Southern England. D I Wes Peterson & DCI Gerry Heffernan are a great team. Wes is a young man from a medical family. He’s the odd one out, a policeman instead of a doctor. He’s married to Pam, a teacher, & they have two young children. 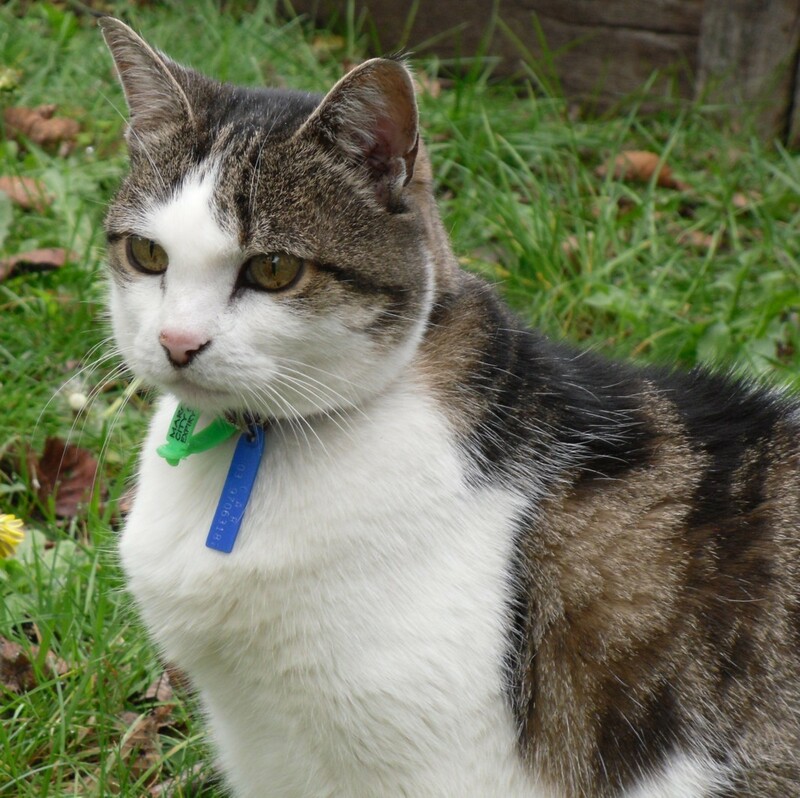 Gerry is older, widowed with grown-up children but recently Joyce, his “lady friend”, has come into his life. Gerry’s Liverpudlian good humour, lack of computer skills & enthusiastic temper contrast well with Wesley’s calm, organized manner. Wes studied archaeology at university & his friend, Neil Watson, is now working for the County Archaeology Department. So, when skeletal remains are found at Tailors Court during renovations, Neil is called in to investigate. The first three skeletons seem to be hundreds of years old so they’re Neil’s rather than Wesley’s problem. But, when the next skeleton proves to be that of a child buried with a 1930s coin, Wesley investigates. Tailors Court was a farm during the war & several children were evacuated there. Was there a connection between the evacuees & the child’s remains? And why do all the skeletons have cuts on them? Cuts that, according to the pathologist, look like an amateur’s attempt at dissection? Wes & Gerry are also investigating the murder of a local GP, James Dalcott. He was shot at point blank range at his front door. Dalcott worked with Wesley’s sister, Maritia, & was well-liked. But, there are several people with motives. A young couple blame him when their son dies of undiagnosed meningitis. James’s soon to be ex-wife, Roz, also had a motive. She left him for another man & she’s now pregnant. Had James told her that he was about to change his will, disinheriting her? Then there’s Dalcott’s work at the secretive private clinic where drug trials sometimes go horribly wrong. Ellis has come up with an incredibly complicated plot with strands going right back to the sixteenth century. Tailors Court was then known as Flesh Tailor’s Court & the sinister Simon Garchard dissected dead bodies in the attic. There are some truly creepy descriptions of Neil's investigations in the attic, left untouched for many years, & the gruesome drawings he finds behind the panelling in one of the rooms. The Flesh Tailor is a very atmospheric, creepy novel. I’m always fascinated by the clever way Ellis combines the historical & modern strands of her plot without flashbacks or dual narratives. This time, each chapter is headed by a section of a transcript of the memories of Mabel Cleary who had been one of the child evacuees. Wes & Gerry’s investigations take them back to wartime Devon, the 1950s & the present day. If you enjoy British police procedurals with a historical theme, this is a wonderful series. I’ve found myself reading more short stories lately. Not sure why as I’ve never been very fond of them. I’ve always preferred novels. Last weekend I read a volume of Thomas Hardy’s stories after reading this post at She Reads Novels about his story, An Imaginative Woman. Then, one of the books in my reading pile this week was Helen Simpson’s Constitutional. I know the proper way to read short stories is to read one, savour it, let the imagery work its way through your imagination etc etc. Well, sorry, I read the whole book last night. Maybe that’s why I’ve not read many short stories in the past. I’m a fast reader (when work doesn’t get in the way) & I feel guilty when I just race through a slim volume. Am I reading it properly, giving the stories proper weight? She ate carefully & greedily, chasing the last recalcitrant beans round the plastic box with her metal fork...She must have cooked it & packed it the night before. No make-up, a bogbrush hairdo, but she knew what was good for her & she was looking after her health. Tom hated her with all his heart. He had to move away in case he took her fork off her & stabbed her with it. I had another restorative work session, concentrating well & thoroughly absorbed. Thank God for work. Save us from the obsessive mental mill which constantly grinds but never digests. Secrecy doesn’t come naturally to me, & this enforced silence was a punishment for which even his wronged wife might have pitied me, had she known about me. For the first time I wondered what she was going through, wherever she was. There’s a lot of humour in the stories & it arises from the minutiae of everyday life. I laughed out loud when I read the passage from If I’m Spared quoted above. If I said the stories were about death, dementia, lung cancer, you might think they were depressing. The stories are about these things but they’re also about the love of a mother for her son in the little space of time she has alone with him, driving him to school. They’re about the thoughts of a woman coming to terms with an unexpected pregnancy. There’s black humour in the story about a woman getting more & more irritated as her friends & acquaintances start dying around her. I need to read all of Helen Simpson’s books as soon as possible. If I gulp them all down & then have to wait five years for the next one, well, I’ll have to live with that.